A discussion document circulated by the Irish Republican Socialist Party to their members. Throughout 2014, a plethora of veterans and independent Republican commentators aired their opinions on what they saw as the futility of armed actions in the current environment. Consecutive letters, interviews and press releases emerged, in what was clearly a co-ordinated if well meaning attempt to put pressure upon those Republicans still on a war footing with the British state in Ireland. The following analysis from the IRSP is not part of that public initiative and should not be viewed in that light. Rather, five years on from the formal announcement of an end to the INLA armed campaign, it is intended as a dialectical analysis of the merits and drawbacks of continued armed actions, and from the perspective of those still deeply committed to maintaining the Revolutionary tradition in Ireland. In 2009 the Republican Socialist movement standing collectively, stated their belief that future Revolutionary struggle in Ireland would be best served using unarmed methods, while simultaneously reaffirming our opposition to the failed reformist politics of the Good FridayAgreement. That statement was made during a period, in which the remaining IRA groupings were assuring themselves and their supporters that they were in the ascendancy and following a short upsurge in armed activity including the shooting dead of two British soldiers near Antrim and a Police man in Craigavon. In the five preceding years, the groupings involved have sustained losses well beyond any perceivable logistical or political gains which could have been attained through their combined efforts. Many scores of Republicans now languish in prison, often in sub-human conditions and facing a heartless and vindictive regime that has decades of experience in the torture and marginalising of Irish POWs. As a movement supportive of all POWs, and whose membership are all too aware of the realities and hardships of prison struggle, we have no interest appearing to belittle the position of today’s Republican prisoners and it is not for us to point out the dynamics which may have led to their incarceration. We do however maintain the right to comment upon the impact which continued armed actions have had on the general political landscape here and on the Republican Socialist struggle in particular. Firstly the imprisonment of so many political activists has been a godsend to the state and to opponents of popular political struggle in Ireland and not only in terms of bodies lost on the ground. In addition to locking up scores of Republicans; Britain has seized the opportunity to tie down remaining activists in an endless cycle of prison based campaigns; ensuring that the time, resources and energies of militantly minded Republicans are eternally deflected from the vital task of building a viable street basedalternative to the corrupt political and economic setup which now exists in Ireland. This alone amounts to a successful outflanking of certain anti-GFA republicans, it is the result of a clearly thought out strategy on Britain’s behalf, yet it has rarely been mentioned by supporters of those practicing armed actions. Instead a misperception is promoted which claims that a viable armed Republican movement can magically be built on the back of prison campaigns. Yet this is rapidly proving not to be the case, and today the partitionist states, their policy makers, financiers and apologists escape relatively unscathed from militant political and social upheaval, certainly in comparison to other European countries, as hundreds of young Republican activists here instead focus their energies (however gallantly) on white line pickets and protests relevant only to a single issue. At a time when Irish revolutionary voices could have been using their energies and talents to utilise public frustration on the street to build the Republican Socialist fight against austerity, sectarianism and the ongoing failures of partition; proponents of armed actions here are in fact depleting that potential, offering a scapegoat argument to our oppressors - who by talking up the threat - both maximise their own budgets and draconian powers and deflect the public’s mind away from the increasing raft of socio-economically grounded injustices and inequalities which are facing the Irish working class today. This is a bizarre position for Irish Republicans to remain static within, it is neither logistically wise nor in keeping with traditional IRA practice, which since 1916 and throughout the decades always advocated recognition of when the time simply was not right to fight. Yet the self defeating dynamic remains in place, it is a dynamic which Britain and supporters of Stormont can live with indefinitely and for as long as the remaining IRA groupings allow, it will ensure that their supporter’s role in building a viable alternative to the rotten political setup here is reduced to a minimum. To date the combined efforts of the various IRA groupings have resulted in British/State casualties on a par only with the least successful IRA campaigns of the past. In addition the state has learned valuable lessons from those campaigns and has chosen not to give the Republican tradition anymore martyrs but instead to wear down the morale and resources of its limited support base with a conveyor belt system of questionable arrests, convictions and increasingly harsh sentencing. In this process they have been tutored well by former Militant Republicans now loyal to the state. As unsavoury as that reality may seem, it remains a reality and one which is not likely to change should the IRA groupings remain within the tight pigeon-hole in which Britain and its Stormont subservients have clearly backed them into. Furthermore the military capability which would be required to kick hard enough in an attempt to break out of that dynamic quite simply does not exist. The British state in Ireland has successfully gauged the extent to which the Irish public will tolerate Judicial and human rights abuses of Irish Citizens, the PSNI directed by MI5 are adhering strictly to a set policy of maximum depletion of Republican resources yet minimum comeback as in terms of any public backlash. By and large that policy is working for them and not least because the public are being taught to focus upon failing and questionable armed actions of Republicans while ignoring the litany of crimes being committed against the Irish Working Class by both the British and 26 County states; ruthless austerity, cutbacks in health and social spending and a general downgrading of the lives of ordinary people. Again this is a self-defeating dynamic, into which the Republican armed groupings have stepped and one which the British and 26-County states are happy to allow exist. And within this unfavourable environment, although IRA groupings claim that their actions are disrupting normalisation, their perceived successes have become successes in their minds only, without having adequately politicised and radicalised a new generation of young people (by stressing primarily the socio-political realities of the time) they are in reality impressing only their own small base. What is at question here is not the right to take up arms against the oppressor; the IRSP does not and never will question that right. The only relevant question which Irish Revolutionaries should be asking themselves at this juncture is ‘what works’? Sporadic armed actions are not working; they are placing zero pressure upon either the British/Stormont or Free State regimes nor upon the capitalist economic systems which underwrite all of those states. In fact they are bolstering the budgets of British Military intelligence and handing a monthly propaganda victory to those who wish to make partition, capitalism, austerity and overt security measures appear to the general public as the rational state of affairs in Ireland; rational in comparison to actions which only achieve a temporary sense of personal achievement for the individuals involved and their supporters on the ground. All criticisms which we as Irish Revolutionaries, as Republican Socialists have of the failed politics of Good Friday; its inescapable ethos of sectarianism, economic inequality and perpetual partition, wrapped up as it currently is, in the environment of savage Tory & Fine Gael cutbacks upon the livelihoods and wellbeing of our most vulnerable citizens; can, will and are being explained away by reference to the sporadic actions of the remaining IRA groupings. As with so many times in our recent history, what is required is the building and mobilising of a fighting Labour movement with a sound position on the question of Irish National Liberation, such as that mobilised by Connolly in the years running up to 1913. Years in which a similar economic reality faced the Irish working class as does today. There is no shortcut to building such a movement, it will not be achieved by one movement or party alone and it will have many hardships and setbacks. Yet now should be the prime time to set the foundations for such a movement, one which could truly challenge the status quo as it now exists, truly upset normalisation and awaken the true national and class spirit of the Irish people. 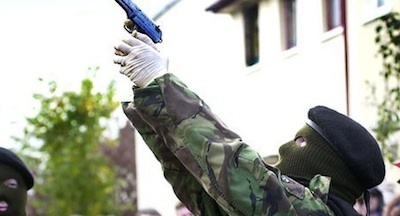 The politics of sporadic armed actions are an attempt to bypass the process of building such a movement; furthermore it is a failed attempt at doing so and one which holds the real potential to create setbacks for those who seek to build a truly effective class based resistance to capitalism and modern partitionist rule in Ireland. Just as advocates of current armed actions assert that they have a right to bear arms in the name of Irish Freedom; in the spirit of comradeship we must urge them to consider what duties come with that right. Not least the duty to consider the logistical limitations which come with practicing armed struggle perpetually in a woefully unsuitable environment. And the very real costs of that decision, both to you personally and to the cause of building a capable Revolutionary momentum, which the Irish people so dearly need and deserve.